Some 50 cruise ships sail to Antarctica. These three luxury cruise ships are the best of the Antarctic cruise ships. 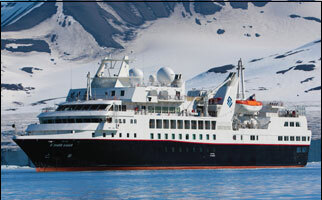 Overall, it is the best cruise ship sailing Antarctica. Everything is in place - guest-pleasing staff, quality dining, comfortable accommodations and public spaces, and laudable naturalists and lecturers. What's special, too, is the camaraderie that develops among the passengers, who number just 132. All 66 cabins are ocean view, some with balconies. 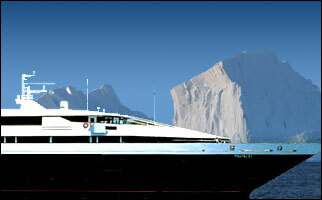 For my Silver Explorer pages, click suite photos, deck plans, and ship fact sheet. To visit the ship's cruise line, click Silversea. The furnishings, interior decor and exterior design of this 264-passenger French cruise ship are sleek, sophisticated, and modern. All cabins are ocean view. Most have balconies. I do not recommend Le Boreal to non-French speakers because that language is the primary one used aboard. Click Le Ponant to visit its cruise line. 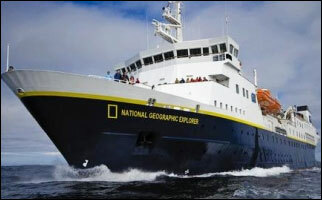 It is jointly operated by Lindblad Expeditions and National Geographic. The ship accommodates 148 passengers and has 81 cabins, all with ocean views. Some have port holes, the others, view windows. Click Lindblad Expeditions for the cruise company's website.